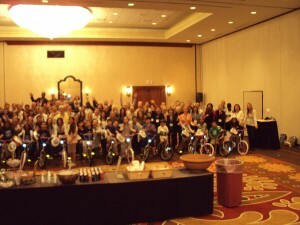 Takeda Pharmaceuticals North America took part in a Build-A-Bike Team Building Event as part of their regional meetings on Monday, November 15th, at the La Cantera Hill Country Resort in San Antonio, Texas. 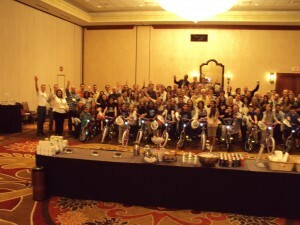 It was a fast-paced, fun-filled event which culminated with 16 bikes being built for children from the Boys and Girls Clubs of San Antonio. The finale of the event is when, to the surprise of the Takeda participants, the 16 children receiving the bikes came into the activity and received the bikes. To see the children’s faces as they get new bikes is priceless; and so is seeing the looks on the bike builder’s faces when those children are introduced. Near the end of the event one of the participants mentioned that they wish they could meet the children that would receive the bikes. They were nearly awestruck when their wish came true. As everyone, participants and children alike, lined up for a group picture the energy in the room was magnetic. The common cause of building the bikes was a lesson used to help apply the activities to team building, but when everyone saw the fruits of their labors making a difference, the feeling and expressions were awesome. Often times it is not the work we do but the results we see that make all the difference. Too often we do the work and forget about the results, or are not keenly aware of the positive difference we are making. When this happens our leadership suffers, our teams suffer, our activities become routine, and we even burn out- losing our passion and desire. Activities like this are important; they not only reinforce the importance of team work and responsible leadership, but also show us that making a difference in our communities and in the world makes all the difference to us as well. What a great program- Takeda had fun and, even if it was an accident, learned something; 16 boys and girls received new bikes; the host hotel contributed extra effort in providing an excellent venue and great support through their sacrificing staff; everyone came together to have a great time and make a significant difference. Thanks Takeda, The Boys and Girls Clubs of San Antonio, and TheLa Cantera – 16641 La Cantera Pkwy, San Antonio, TX 78256.